There are two approaches to trek and climb in the Himalayas—the Western ego-driven way and the Buddhist Zen way. Both will get you to Everest Base Camp, but they are as different as winter and summer. Egocentric Westerners are often portrayed as willing to risk it all to summit Mt. Everest and that attitude is sometimes blamed when fatalities occur. The Buddhist Sherpas that guide and support these expeditions are seen as more enlightened for their Zen, big picture approach. Because you choose to trek to Everest Base Camp and not the summit you’re not looking to conquer your demons proving yourself atop the world’s highest peak. Chances are you may want to take the Zen way up the Khumbu Valley and Tusker’s 18-day trek to Everest Base Camp is the perfect place to do that. Hiking in the Khumbu Valley above Naamche Bazaar offers views of four of the six highest peaks in the world. This could make you feel insignificant as well as take your breath away. The rivers and glaciers birthed by these mountains are also humbling images. In many ways being humbled can lead to releasing some of the ego that may have blinded you to nature’s kaleidoscope in your pursuit of bucket list achievements. The Zen way to Everest Base Camp is less about the destination and more about how you’re trekking. Of course getting to the destination is important, but so can be the entire experience en route. With a holistic approach that is less about you and more about your environment if you don’t make it to Everest Base Camp, you’re disappointed, but it’s not the end of the world. Exploring the vast interconnectedness of ourselves in nature is more important than proving something to ourselves. That is the Zen Way. If you want to explore the myriad complexity of the Himalaya’s culture and how it’s interwoven in nature it may be worth developing a yen for Zen. Tusker’s trek through the Khumbu Valley up to Everest Base Camp at 17,598 feet travels through the heart of Himalaya Sherpa Culture. Their Buddhist shrines and monasteries along the way are open to visitors and you will meet monks and their humble disciples who are invested in the Namaste spirit. Although Nepal is largely a Hindu country, Buddhism is the dominant faith among the Sherpas living above 10,000 feet. Sherpa climbing success has been largely attributed to 6,000 years of evolution that imbued them with enlarged lungs and blood cells to deal with a lot less oxygen. But that’s not the only reason they have been the world’s best climbers. Their mental approach stems from their Buddhist beliefs and this plays an important role in their thin air superiority. Patience is one of those goals yet to be achieved for many of us. Impatience stems from our frustration of being delayed or other petty annoyances that we have no control over. We stress and over react to the slow hikers ahead of us or the yaks taking up “our” trail. Perhaps it’s better to wait for the traffic to move up the trail. See the delay as a chance to study the countryside perhaps take a photo of the beauty surrounding us or of the yak and his herder. Don’t let your frustration build. For high altitude trekkers without Sherpa lungs patience is essential. The Buddha who was born in Nepal taught his disciples that patience is an act of self-compassion and leads to equanimity. It’s also a key ingredient to adjusting to high altitudes. If we slow our tempo and hike at a much slower rate we have a better chance adjusting to Nepal’s thin air. Patience is partially about staying calm lowering our blood pressure and breathing, all good physical states of being in combating altitude sickness. If our mental state is under control it will help our bodies acclimatize. Unfortunately patience doesn’t come naturally and the Buddhists practice getting there through meditation with the goal of clearing the mind of distraction and negative thoughts. The simple analogy is a pond of water. If the mind is clear and unfiltered you will be able to see things as they are and not allow negative baggage to interfere with your trek. If that Uncle Sam tax bill or the abrasive boyfriend or girlfriend you left 6,000 miles behind is clouding your pond, chances are you won’t be focused on your breathing or that blister forming on your little toe. Don’t let this mud pollute the purity of your immediate focus of enjoying a trip of lifetime. If your pond is getting murky with self-doubt, drop into the Buddhist temple in Naamche or Tengboche. Sit calmly close your eyes listen to the monk’s chanting and visualize nothing but the towering peaks above you. 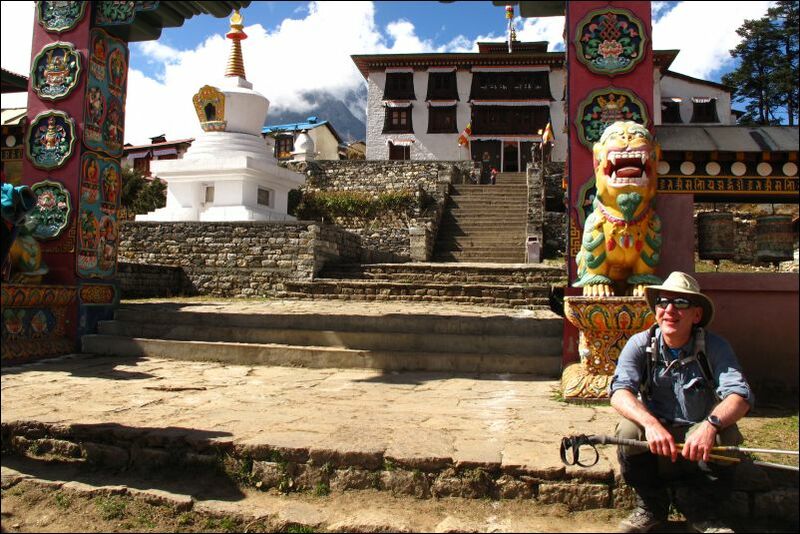 Hiking to Everest Base Camp requires you to be in peak physical shape. You will trek over 75 miles gaining over 8,000 feet of elevation. In addition to your pre-trip physical conditioning hikes in your local mountains you should experiment with meditative walking if you want to try the Zen trail in Nepal. On your conditioning hike go alone to maximize focus altering your pace and mental state. Instead of constantly thinking about your hike’s ultimate destination focus on closer goals, i.e. a boulder, the uneven trail, a sign at the next trailhead, a bird’s flight. Once you have achieved these close-in goals find another short term goal. By not focusing on the end result you remain in the moment and your conditioning hike goes quicker even though you have slowed the pace. You have seen and experienced a lot more than being singularly focused on the end point. The goal of these hikes is to spend time on the trail conditioning both your body and your mind to be totally in the moment. If you’re mind gets distracted and you start to let worrisome problems that lie in the future and have nothing to do with your current hike take a reset rest. Take a deep breath and refocus on the next nearby marker. An increasing number of foreign Himalaya hikers are spending time at the Kopan Monastery just a five kilometer cab ride from Kathmandu’s Airport. Either before or after their trek they visit Kopan for the day or sign up for a three day course and stay there. It’s a way to learn more about Buddhist teachings that they can apply to the trek as well as life situations. We’re not suggesting you do it, but if you have an interest in pursuing the Zen Trail to Everest Base Camp it could give some guidance. But you know who you are and the Zen path is a stretch for most north Americans. We often wear our ego on our sleeve and aren’t defensive about. And shouldn’t be. It’s who you are, it made you successful in business/sports and you’re not about to change a winning formula. Pushing yourself to the limit because of your fear of failure was likely wired in your DNA centuries ago. Don’t apologize for it, but be aware of what makes you tick.